Not to get too technical, but generally its three most important qualities are hoppiness, depth of flavor and... proximity. So when an awe-inspiring beer bar debuts with taps right at your table, you need to know pretty much right now. Introducing City Tavern, opening Monday in Culver City. You’ll find this bastion of sudsy innovation just a few steps from Rush Street—it’s the same owners, so you can expect upscale pub grub, open beams overhead and plenty of screens showing the game. 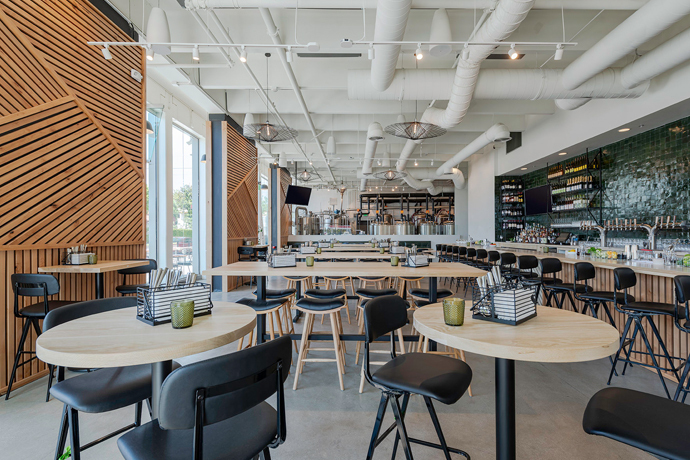 If that’s what you’re here for, grab some stools at the communal counter, summon a Brew Burger on a pretzel bun and enjoy yourself. But we’d like to make a recommendation: call ahead. Book one of the three booths in the back, by the bar. Then come on in and get comfortable. You’ll notice three taps right there within your reach—the brews will change, but there’ll always be a light, a medium and a darker brew, generally from here in California. Once your waiter activates the system, you’re free to sample all three; there’s a small screen underneath that keeps track of your consumption. Think of it like keeping score.